A 53-year-old woman has given birth to her daughter's baby in one of the first surrogacy cases of its kind in the Midlands. Annie Casserley underwent a Caesarian operation. Her first request on waking from general anaesthetic was to see her daughter holding the baby. Emma Hattersley, 35, from Streetly, in Birmingham, has a serious lung disease and risks dying if she gives birth. Baby Annie Trinity Hattersley was born on Thursday weighing 7lb 8oz. Mrs Casserley, who has four grown-up children, was implanted with eggs from her daughter. But despite her age, the pregnancy was without complication. 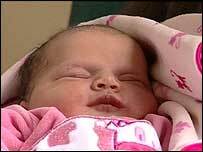 She told BBC Midlands Today on Friday that she had "no qualms" throughout the pregnancy or at the time of the birth, at Good Hope Hospital in Sutton Coldfield. "It felt like the right thing all the way," she said. "We had discussed it over the years and then got to a point where we saw a couple of mothers who had done it for their daughters and just went for it." Emma, who is a paediatric nurse, was diagnosed with histiocytosis X when she was 19. The condition means she will never be able to undergo a general anaesthetic or do anything that puts a strain on her heart or lungs. "She (Mrs Casserley) is the only person I would trust to have a baby for me. I would not have trusted anyone else," she said. Emma added that she and her husband, Andrew, 34, would talk to their daughter - whose middle name of Trinity is a reference to the fact that three people were involved in bringing her into the world - about the situation when she was older. Consultant obstetrician Dr Michael Maloney said that he and his colleagues felt that on balance the safest way for Mrs Hattersley to have a baby was for her mother to bear it for her. Carol O' Reilly, co-founder of Surrogacy UK which is based in Gloucestershire, said: "It doesn't happen very often because most people's mothers are too old. "But, there is nothing worse for a mother than seeing her daughter suffering and not being able to have children is heartbreaking, so if you can help I think that is a wonderful thing."